How do I put a game to a scoreboard? See the Adding a Game To a Scoreboard page. How do I manage the scoreboards? See the Managing Scoreboards page. How do I make a scoreboard appear on the front end? Gallery is the only format that works as of this writing, and it’s the default, so it can be omitted. What are venue groups and how should I use them? Venue groups allow you to control the display (shortcode) of game venues. If you have a large number of game venues (formerly game locations), you can organize them into groups and display the groups of venues in separate tables. How do I put a venue in a venue group? There is an MSTW Venue Groups metabox in the right hand column of the Edit Venue admin screen. 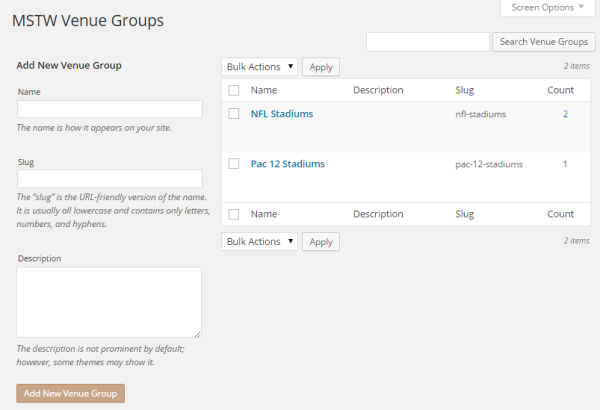 To create a new venue group, simply type in the name you want to use, or use the “Choose from the most used venue groups” link to access existing venue groups. How do I manage the venue groups? There is a Groups column on the (All) Venues admin screen. 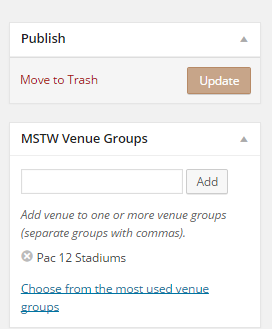 Those links will take you to the MSTW Venues admin screen, where you and add, edit, or delete venue groups. Why are the links to the single game pages broken? This appears to be a (somewhat) common problem when a custom post type, like the GAMES CPT, has been added after the permalink settings were last updated. To get the single game pages working, simply re-set the permalink settings. Go to the WordPress Dashboard -> Settings ->Permalinks. Change the permalinks to anything other than “Post name“. Save. Change the permalinks back to “Post name“. Save again. Done. How do I change the look of the venues table? Edit the plugin’s stylesheet, mstw-ss-styles.css, located in mstw-schedules-scoreboards/css. The Venues Display Settings admin screen provides control of a few elements, especially the map thumbnails in the table. I don’t really like Google Maps. Can I use other mapping service? Yes. The custom URL field is provided for that purpose. An entry in that field will override the venue’s address information. The user will be directed to the link in the custom URL field. For example, this field can be used in the rare event that an address is too new for Google Maps, or to provide MapQuest maps in place of Google maps, or to spruce up the Google maps to show driving directions from a particular point and the route outline on the map. I use names for venues that sometimes aren’t recognized by Google. What should I do? Use the custom URL field, then the title will display, but won’t be used in the Google address.